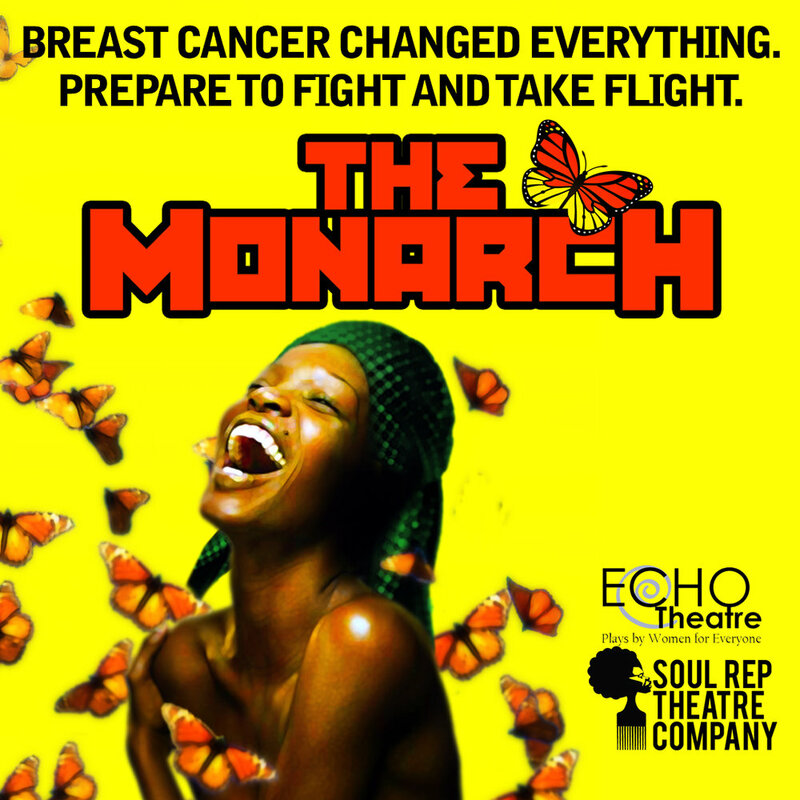 In a co-production from Soul Rep Theatre Company and Echo Theatre, Anyika McMillan-Herod's The Monarch soars. Dallas — Sad to say, it’s probably significantly more difficult to find a person whose life hasn’t been touched by breast cancer in some way than it is to find someone with no connections to it whatsoever. So it’s hard to imagine the person who couldn’t find some meaning or relevance in Soul Rep Theatre Company’s production of local playwright and Soul Rep co-founder Anyika McMillan-Herod’s moving The Monarch, based on McMillan-Herod’s experience battling—and thankfully surviving—Stage 3 breast cancer. The quartet of powerhouse actresses in the piece explore the many varied emotional responses to each stage of cancer, from anger to despair to humor and, finally, to hope. It’s been a bit of winding journey for this piece. With material sourced from McMillan-Herod’s journals during her experiences with cancer, the show was originally performed as a staged reading six years ago in Dallas. The Monarch was then workshopped in 2015 before being performed as part of Soul Rep’s New Play Festival that same year. Excerpts were then performed as part of Echo Theatre’s “Echo Reads Series” in March of this year. Clearly the piece made an impression, given that when a slot in Echo’s season opened up unexpectedly, Echo immediately offered it to Soul Rep, as a co-production. Co-directing The Monarch are Tonya Holloway, the Co-Artistic Director of Soul Rep, and the playwright herself. In its final form, the piece is a series of 10 vignettes (with a recorded prologue and epilogue), whose characters and settings vary wildly, but whose connecting thread (of course) is women’s experience of breast cancer. The play’s guiding metaphor for how cancer transforms survivors is the monarch butterfly’s life cycle, information about which acts as a framing device for the show and serves as the source of the play’s title and character’s names. Subsisting in its infancy on plant life that’s toxic to other creatures, the monarch enters its chrysalis and emerges eventually as something battle-scarred, but beautiful. It would be an exercise in futility to try and single out one performer from the piece, as each actress turns in a uniformly excellent and very distinct performance, showcasing different strengths and embodying many different facets of the cancer experience. Morgana Wilborn (The Egg) offers up several raw performances, notably her initial character’s agonized confrontation of the loss of her breast and a searing monologue as a woman who beat cancer, but whose husband then left her via note. Chris Sanders (The Caterpillar) partners with Wilborn as the nurse fitting her character’s prosthetic who has scars of her own. She scintillates in a monologue regarding post-cancer sexuality, swinging between sensual memories of her past experiences with her husband, and her hope of reclaiming that part of herself as she heals. Monique Ridge-Williams (The Chrysalis) dominates the stage in a sort of self-dialogue (half-spoken, half-dance) with Guinea Bennett-Price (Soul Rep’s Co-Artistic Director) as a sort of warrior alter-ego of a woman spiraling into what ifs after her diagnosis, and later gives an aching turn as “Joy,” who turns to alcohol and shuts out the world after being diagnosed. Bennett-Price has some of the funniest moments. Despite the seriousness of the segment, her turn as Joy’s persistent friend is both natural and hilarious, and her final performance in the solo vignette in “Damn Kale!” is funny enough that it would be criminal to spoil its punchline. An ensemble scene titled simply “Chrysalis,” with recorded dialogue from Sanders, is almost uncomfortably intimate, but beautiful, and the final visual of the four women entwined in a sort of four-person Pieta was arresting. The set itself is simple, mostly consisting of various configurations of crates and boxes, but executed well (all the performers do double duty, also making their own costume changes and striking and rebuilding the set for each scene, which they managed with only a few very minor hiccups). Elements of traditional African garb, vocalization, and dance are used sparingly, but very effectively, and tie in with the overarching sense of spirituality threaded through the piece. Michelle Graves provides percussion throughout, and despite being essentially onstage with her instruments, is never overpowering. While the play strives throughout to try and portray different aspects of the cancer experience, and to explore differing viewpoints of women at each stage of the disease and its aftermath, the show’s ending is unabashedly hopeful, with any dissenting views expressed earlier seemingly stripped away. It's not easy being a small, black theater company without a permanent home in Dallas. But Guinea Bennett-Price, Anyika McMillan-Herod and Tonya Davis-Holloway didn't start Soul Rep Theatre Company because they thought it would be easy. They did it because they felt it was necessary. They're readying their signature 1998 production, The Freedmans, for a run at the Wyly Theatre's Studio Theatre, where it is one of the shows in the Elevator Project, presented by AT&T Performing Arts Center and Dallas' Office of Cultural Affairs. And they're thinking ahead to a future that they hope will include a permanent home, professional status and publication of company-developed scripts like The Freedmans that can be performed around the country. They didn't pick the show because it was easy either. They picked it because this original show about real and imagined lives of people buried in Dallas' Freedman's Cemetery represents their mission and determination to tell the stories of the black community in Dallas and to give black artists a place to shine. "We don't want what happened to the Freedman's Cemetery to happen to us," says McMillan-Herod. "We don't want Soul Rep's legacy paved over and erased. We must continue to tell the story of African-American voices." For Bennett-Price, who will co-direct the show again with Ed Smith, it's been "a labor of love." "It has many layers of meaning for us because we were making history by documenting true stories when the Freedman's Cemetery opened 20 years ago. It came out of wanting to know more about our past and where our families are from." The company was inspired to develop the piece after the segregated burial ground, which included graves of black people from the Civil War to the 1970s, was rediscovered during the expansion of North Central Expressway. McMillan-Herod, Chris Herod, Nia Akimbo and Keith Price wrote short scenes and monologues that told the story of a former slave enraged by a farmer who tries to force him to work in the field again; an old woman who grows confused as she thinks about the African village where she was born; and a young couple, parted by slavery, who are striving to find each other again. They've updated the production by performing it in the round and adding a young seer to complement the existing character of an elder seer, with a scene that explores what would have happened to the Freedman community if it had never been touched by development or the Jim Crow laws that discriminated against black people. McMillan-Herod and Bennett-Price are graduates of Booker T. Washington High School for the Performing and Visual Arts, where Bennett-Price teaches. Davis-Holloway, who is from Fort Worth, grew up on the stage of Jubilee Theatre. They founded Soul Rep in 1995, with Bennett-Price and Davis-Holloway ultimately moving into their current roles as co-artistic directors and McMillan-Herod as managing director. In 2003, the company went on hiatus as the women married and took time to work better-paying jobs and raise children. Ten years later, in 2013, one of the first shows they did in that first year back was The Freedmans. They have performed at the Margo Jones Theatre in Fair Park and are now the resident theater company at South Dallas Cultural Center. The new production is full of memories from the women's personal past. Davis-Holloway's daughter, Demoreia Holloway, now 19, played an infant in the inaugural show. Bennett-Price's sons, Emir and Esau Price, and McMillan-Herod's daughter, Layla Herod, performed in 2013. Emir Price caught the acting bug during that run. He's now a Booker T. High School senior and one of 60 nominees for the 2018 U.S. Presidential Scholars in the Arts. While their children grew up with the stories told in the show, Davis-Holloway points out that many young people didn't. The last time Davis-Holloway was at the cemetery, "I saw people casually walking to and fro and I had the feeling that the city doesn't know why this land is blocked and gated. This is a site where people should stop and tour and tell stories. It's a vital part of Dallas that needs more awareness." The women are also determined to turn Soul Rep Theatre Company into their legacy — something like the Freedman's Cemetery Memorial, that can be a repository of history, but also a vehicle to tell stories of the present and future generations of black people in Dallas. McMillan-Herod envisions Bennett-Price's son, Emir Price, as someone who might return to Dallas, after professional training, ready to take up the baton at Soul Rep Theatre Company. "We want to build something that will last and be a gift and a light in our community," McMillan-Herod says. "We want something that we can ultimately pass on to another generation." Anyika McMillan-Herod directed the Soul Rep Theatre Company production of this five-part memory play, now onstage at the South Dallas Cultural Center. Pulling at the thread connecting all of Orlandersmith’s works, Yellowmanexplores the extent to which the sins of the parents damage the children. Soul Rep Theatre Company engages children of color with the energetic RE-TALES: The Flyest Fairy Tales Ever Told. Dallas — “Creating opportunities for children of color to experience theater that is reflective of their culture” is one of the hallmarks of Soul Rep Theatre Company. RE-TALES is actually a refreshed version of a resurrected older piece (Rep Tales) written by company co-founder and artistic director Guinea Bennett-Price and her husband Keith Price. For this retelling, they changed a few characters and added music written by Professor Keyz and Keith Price. The best elements of this production are the children in the cast, most of whom are experienced though young. They are excited, energized, confident and appear to be having fun. Thanks to a Racial Equity grant from the Communities Foundation of Texas, and an ongoing relationship with the South Dallas Cultural Center, Soul Rep is able to have performances for elementary and middle school children in the South Dallas area. Children in the cast are: Dustyn DeWayne Carter (Kid/Flower), Te’a Casa (Mary contrary, Flower No. 3 and Wolfette), Jaylon Mobley (Wolf Pack/Driver/Flower), Qaadir Muhammad (Lil’ Red), and Esau Price (Pinnochi-Toe). Two actors have portrayed Spry Lady: Carrington Whigham and Jori Jackson. Leading the ensemble and in the title role is Jaquai Wade-Pearson as Ms. ReTale. The role of Sherry Perry is carried by Morgana Wilborn. Douglas Carter (Poppa Puppet Maker), Gabrielle Gray (Mama Red/Wendy) and Irwin Daye (Wolf Man) round out the cast. Structurally, the script needs work, as does the soundtrack which leaves a few of the actors’ singing abilities unnecessarily exposed. Awkward. Some of the conceptual disconnect may have resulted from having two directors, Guinea Bennett-Price and Daylene Carter. But for its struggles organizationally, RETALES holds together because of the children. Tonya Holloway and Shirley Tyler’s costumes help clarify the identity of the characters without exaggeration. RETALES is about an hour long, which is perfect for families with small children.